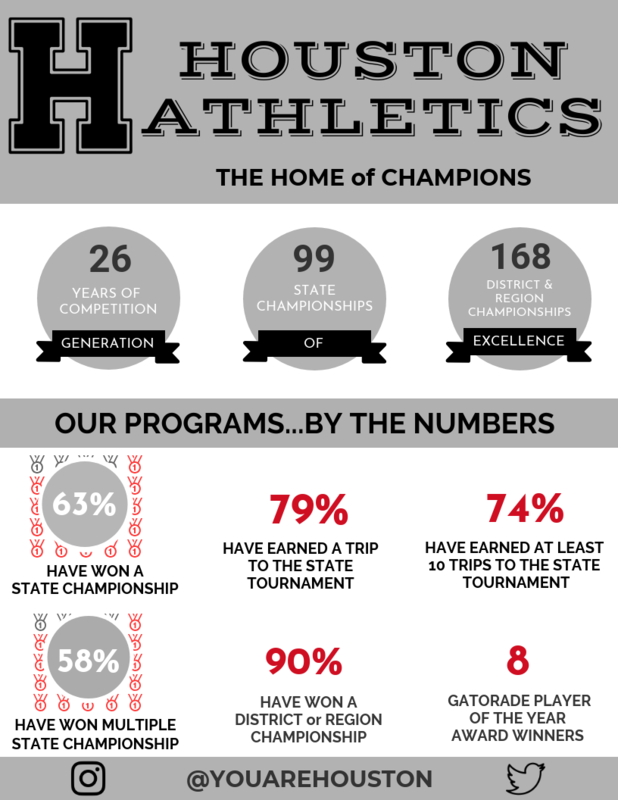 Since records of competition began in the State of Tennessee, only two public schools have earned more State Championships than Houston High School. Those two schools have been open a combined 102 years longer than the lone high school in GMSD. Our history of success is due to a combination of incredibly talented student-athletes and driven, sacrificing and skilled coaches. We are extremely proud of our record of producing students prepared for any classroom, court, field or situation. Athletic teams at Houston High School strive to be champions while maintaining a high-level of sportsmanship and dignity. Opportunities abound for students interested in being a part of the athletic program, with 10 male and 10 female sports offered. With 20 TSSAA recognized competitive sports, Houston High School also offers several club sports which vary in their level of competitiveness. At Houston, there's truly something for everyone. What does it mean to be the best…a champion? To work and prepare physically and emotionally for up to 6 months for a single event, a competition of skill, a test of wills. The highest stakes in the most public forum with the results immediately published for the state and (in many cases) the country to see. Results that will frame those 6 months in history as a justifiable reward or a crushing failure. Even though deep down, there is an understanding, being a member of a team at Houston High School is about the journey together with your teammates. People who often share that bond can be closer than your biological family, people who have shared in your blood, sweat and tears, people who seen the most fragile and ugly of you without wavering in their loyalty. Building those bonds within a team, teaching the fundamentals of the sport, along with instilling the leadership skills, character and perseverance is at the core of what athletics in our school district and specifically at Houston High School strive for every day. We believe these experiences are essential in the development and maturation, both physically and emotionally, of students in our district. If an individual program can do those things alone, it is considered a success. But what makes athletics at Houston High so unique is it does that AND wins championships.